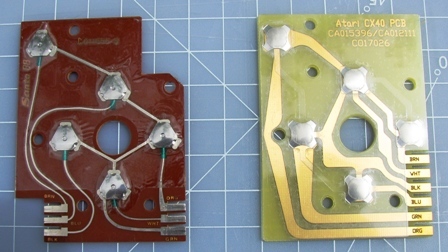 The original PCB is pictured on the left while the replacement from Best Electronics is on the right. The PCB after a few passes have been made with a utility knife. It takes quite some time to make progress, so just keep at it. 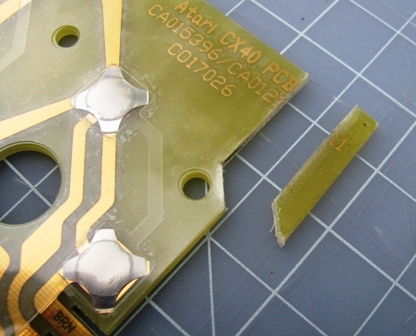 Because the new PCB will not fit into the joystick as-is, you will need to cut out a small section with your knife. The picture above shows the area in which the material must be removed. You only actually have to remove a few millimeters of the PCB, but I cut off about 1/4 of an inch because it was easier. You will have to make numerous (at least 20) passes with the knife in order to make a deep cut in the surface of the PCB. Once you’ve cut about halfway through, flip the PCB over and make a few cuts on the bottom. You will be able to see the cuts you made on the top through the semi-transparent material, so it will be easy to line the cuts up. 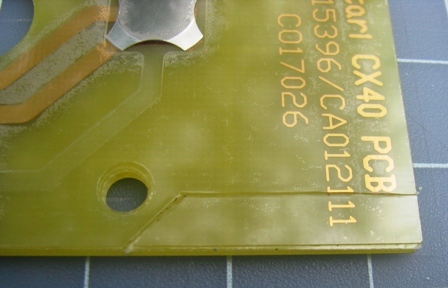 Once you have made enough of a dent on the top and bottom, you will be able to snap the extraneous piece off of the PCB. After making several passes with the knife on both the top and bottom, the un-needed piece cab be easily snapped off. Now let’s take the joystick apart so that we can swap out the PCBs. The joystick is held together by 4 screws. Removing them allows you to open the controller and lift out the top half. Removing 2 more screws allows you to pull off the PCB. 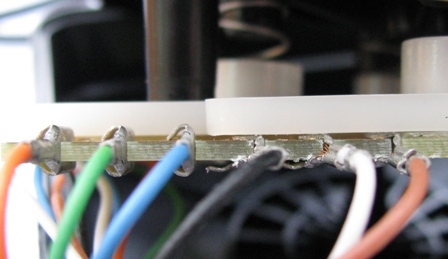 Use your needle-nose pliers to remove the 6 wires by grasping the metal contacts, not the rubber insulation of the wires themselves, and gently pulling them off of the board. The replacement PCB has its contacts labeled as to which colored wire goes where, so wiring up the new one is a snap. Before you screw everything back together however, you need to use your needle-nose pliers to flatten out the contacts on the ends of the top 3 wires. Because all of the wires connect to one side of the PCB, they get in the way of the white plastic piece that lays over it, and by flattening out the contacts we can minimize the problem. Flatten out the contacts on the top three wires with your needle-nose pliers so that they fit comfortably underneath the white plastic. Once you get that taken care of, put the piece of white plastic back against the springs, lay the PCB on top of it, and screw it back together. The new PCB is attatched to the top half of the stick., which is now ready to be put back together. As you can see in the above picture, I used a zip tie to bundle the wires together. 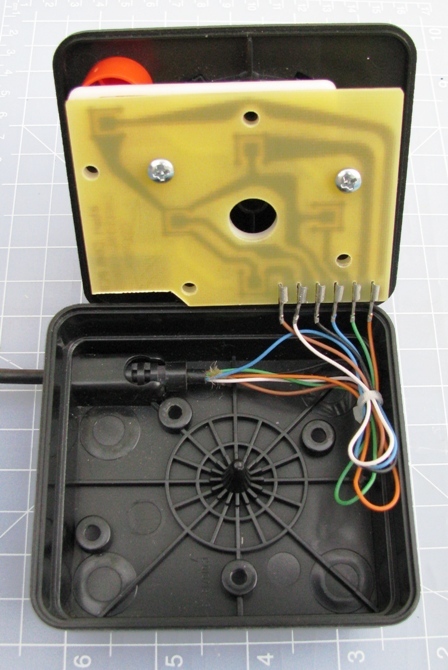 Because half of the wires were attached to the far side of the PCB, the wires are now longer than they need to be, and can get in the way when you are re-assembling the joystick. Remember that the wires can not fit underneath the PCB, so you have to lift them out, insert the top portion of the stick part-way, and then stick the wires up against the side of the assembly. Then push everything in the rest of the way and screw it back together. If you’re lucky, everything will work properly right then and there. With this stick, I had to adjust the spring tention of some of the springs slightly, but that may have been a pre-existing condition of the stick, which didn’t work properly when I bought it. After some minor adjustments however, the stick now works great. If you have any CX-10’s laying around that aren’t working properly, a replacement PCB from Best Electronics is probably all that it needs. Tagged 2600, Atari, Best Electronics, CX-10, CX-40, How to, Joystick, PCB, Repair, VCS. Bookmark the permalink.